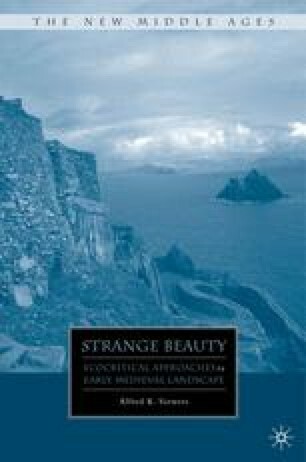 After rereading the Otherworld trope and Eriugena’s philosophy in terms of connections between environment and text in early Irish Sea cultures, examining the Irish color term glas in two other literary tropes can highlight environment as text in archipelagic ascetic practices. The colors of the winds and colors of martyrdom in early Irish tradition illustrate how color can textually and iconographically express the fluidity of the boundary between body and idea, human and nonhuman, physical and spiritual. In them, color becomes a métonymic expression of landscape, linking the visual and the textual. The primary overlap between the two tropes is found in environmental and cultural associations of the term glas, best translated as “the color of sky in water.” Glas is the color of a southwest wind, from the quadrant of Ireland oriented by tradition toward the Otherworld and by geography toward the ocean. Glas is also the color of a nonviolent ascetic “martyrdom” involving strict self-discipline, glasmartre. The latter encompasses specific bodily and environmental practices, and in them its color evokes biblical aerial waters and clouds associated both with Eriugena’s cosmology and hesychastic-style exercises linking the body and physical world with the uncreated light of divine energies. These motifs of the winds and martyrdom, in the relation of shared colors, evoke the physical context of the Irish Sea archipelago itself.